Mostly about growing up the 1950s in Ilford, Essex. I have been a bit slow here because I am working on another blog and planning a third one. But I hope I will finish this one! The original idea was to continue with some odds and ends from  One for the Pot but I’ve decided to take a trip elsewhere and look at transport. You will, of course remember  and  where I looked at roads but I will give a brief reminder here. As always, there may be some sweeping generalizations which are not 100% accurate. Much of what I say will be a list of things we didn’t have. 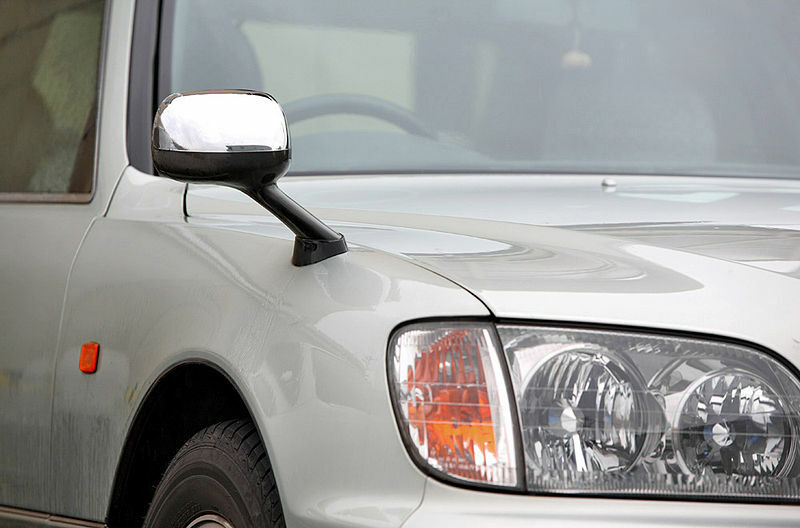 Some other things we didn’t have – breathalyzers (or blood alcohol limits,) sleeping policemen (humps to slow down traffic,) radar or camera traps. Apart from the 30 mph limit in towns, most roads had no speed limits. It was much easier to be a pedestrian because traffic was so low. We walked to school from the age of five (unaccompanied) down streets where we could walk safely down the middle of the road. If a car did come it was so unusual we heard it from a long way away. There have been so many changes to traffic lights, most of which people may not have noticed, all presumably designed to make crossings safer for pedestrians. You will have to bear with me because I can’t find good pictures of old lights or new lights to illustrate what I want. 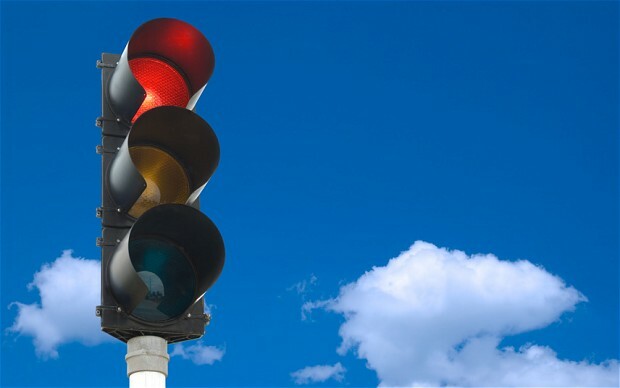 Traffic light junctions used to be just simple four-way intersections with no filter lights, no slip roads and no lanes. As you approached the junction you could see the lights at the corner before the junction and also the other side of the junction. So as a pedestrian you just looked round and could see the state of the lights – and cross when you knew you were crossing traffic barred by red lights. Of course modern Health and Safety standards don’t trust pedestrians to make such decisions and they have done several things to make this difficult. Lights on the far side of the junction have been removed – occasionally causing problems for the poor driver who stops just past the stop line and can no longer see what’s happening. We have surrounding tubes, fairly similar to those in the picture above to make it more difficult to see the light from the side. There are sometimes strips across the light (like open Venetian blinds) further restricting the views. Generally there are pedestrian lights. You used to see these across the road but now you can only see just in front of you. It’s probably worth starting by saying that my first experiences of actually driving a car came from my first lessons in the mid-seventies. So they were probably even more primitive in the fifties. 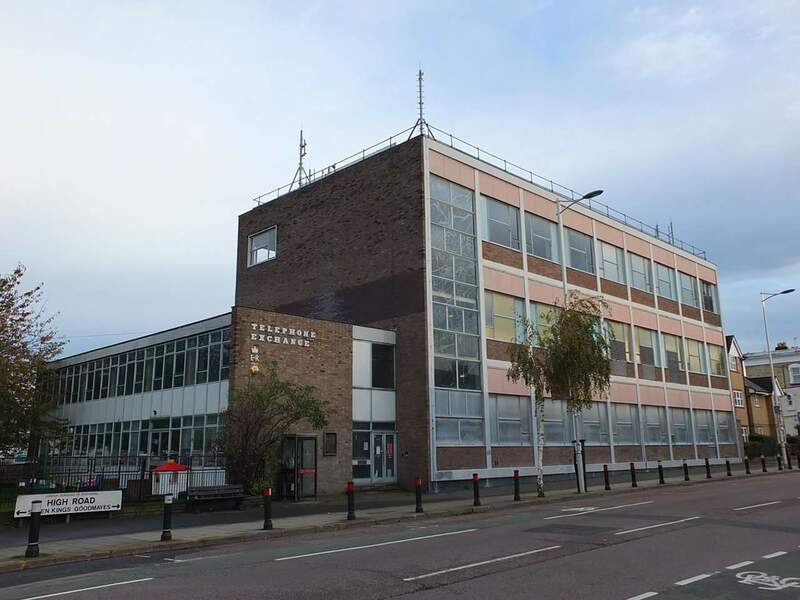 I did pick up some information from a temporary summer job in the early sixties with a firm that did contract car hire. Cars were less powerful and less reliable; needed more maintenance and attention; were more complex and difficult to drive; and were much more noisy and uncomfortable. When you buy a car now there are lots of options and choices. Back in the early sixties there were more or less just two optional extras. A heater was common but it was just a way of diverting hot air from the engine. No fan, no choice of air vents, no temperature control – it was on or off – and certainly no cooling or air conditioning. 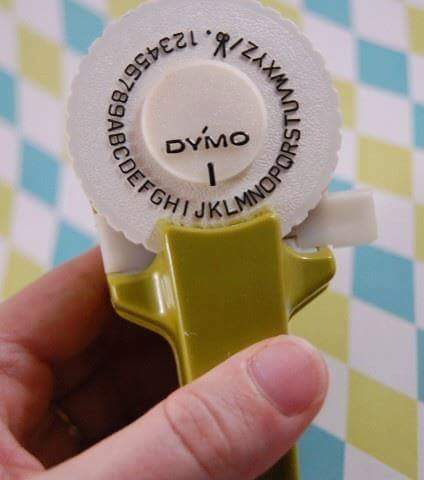 Most cars had one. The luxury extra was a car radio and you may want to consider what Radio used to be. It would have been just radio. No CD or any other recording devices. Not much channel choice. You can of course also forget Satnav, seat belts, airbags, power steering, hazard lights, heated demisters, variable speed windscreen wipers (or rear wipers), any wind-screen washers and any form of automatic locking. A car key looked like a modern Yale door key and you had to open each door one by one with the key. But let’s look at some more technical details. Controls were on the dashboard, not the complex multi-function sticks we now have on the steering wheel. 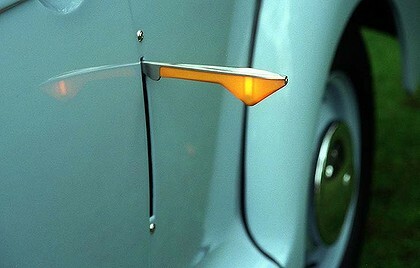 The switch for dipped headlights may have been a button on the floor operated with one foot. 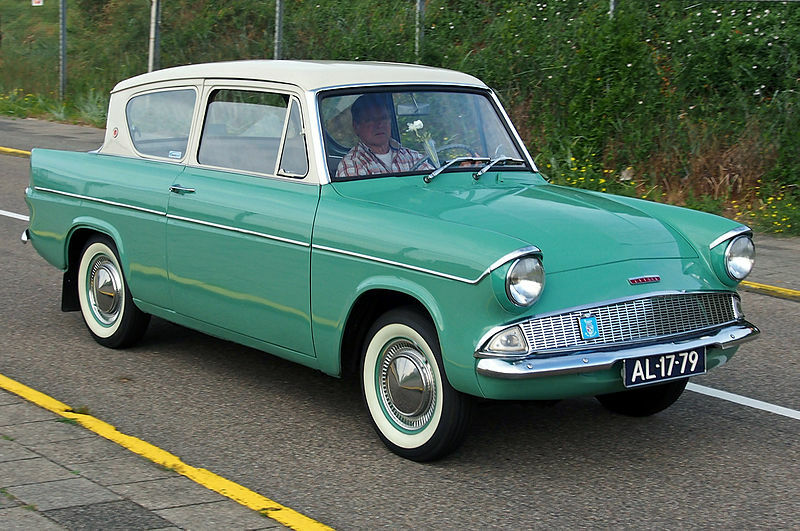 MOT Tests started in the UK 1960 – testing old cars for roadworthiness. They test many aspects of safety such as lights, tyres etc. but in the early days a common cause of failure was – rust. In those days cars were made almost entirely from steel but even steel will rust when subject to the spray from roads spread with salt in winter. Cars inevitably rusted after just a few years. You could have your car under-sealed for a cost of about £1000, a very significant addition to its basic cost, and this would reduce the effects of road salt. Wikipedia calls it a thick resilient coat preventing small stones from damaging the paint. [US may know this as undercoating.] Anyway gradually undersealing became better and it became a standard part of car technology that car owners probably don’t even know is there. Cars now easily last for decades without the problem of rust. We now generally have automatic windows but some cars still have the manually winding handles for rear passenger windows. All windows used to have these controls apart from the quarter-lights, small triangular windows at the side. [The picture above shows where we had quarter-lights but the rest of the picture is far too modern. As explained above we didn’t have the mirror shown.] These little windows were used to provide ventilation. 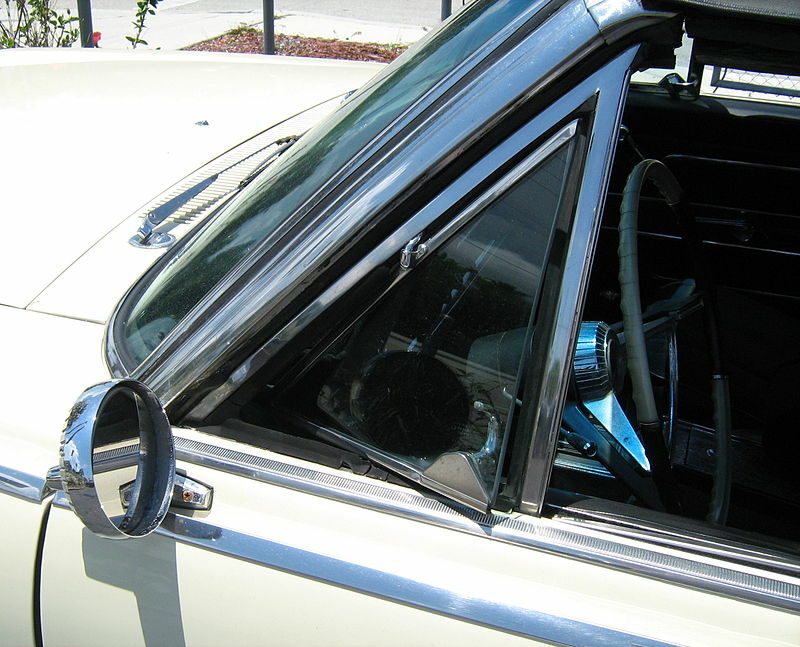 Talking of ventilation there was sometimes the problem of cars getting too hot in summer sunlight. (No, we certainly didn’t have air-conditioning.) Apart from the quarter-light your only option was to wind the main side window down a bit. This was difficult to manage at any speed because of the wind problem. 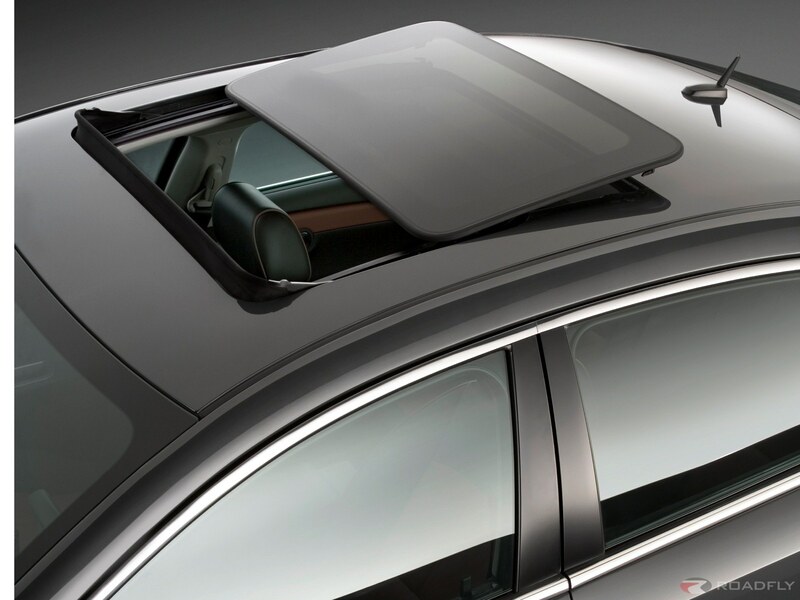 One option was a sun-roof, which allowed for some ventilation without the problem of noticeable wind. [As for the others, the picture above is far too modern but it does illustrate the idea of a sun-roof.] I don’t think they were common until the late sixties but at some stage much later sun rooves became almost standard for new cars. They disappeared when air-conditioning took over. Of course people smoked a lot more and so ventilation may have been more useful. I think ash trays were fairly standard and a cigarette lighter was one of the earlier options. The lighter has gradually changed into the port we now use to plug in free-standing satnav devices and MP3 players. Of course plastic anywhere was unusual. Seats, if not leather, were proper woven fabric. 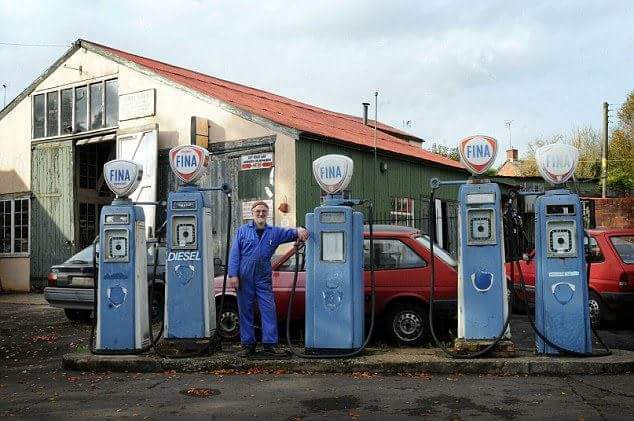 You have to remember that petrol came from garages that also performed the service functions now done separately. As well as serving you with petrol – they were not self-service! – they would do regular services, oil-checks and anything else that needed attention. And cars needed a lot more care! Now most cars need a service once a year and generally need nothing else in between. Back then services were every three months and you had to know enough to check the oil in between. 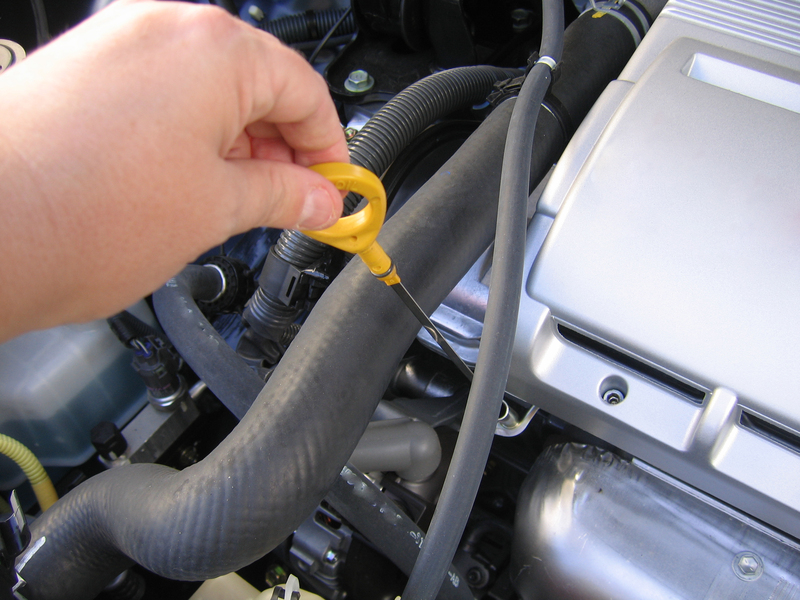 You had to search under the bonnet [US: hood] for a dipstick, pull it out and you could see the oil level. (Yes, the picture is far too modern but it does show the principle.) You were advised to check oil at least every week. I have to say a little about reliability. Now cars are so efficient and easily manageable that we forget that they used to need care and attention and maintenance. From somewhere around 1960 I remember sometimes being taken out in the car just for a ride in the country. I can remember times when the performance was not good and Dad just drove to a garage. They would do things like checking, cleaning and adjusting spark plugs. Yes, I know, you may be thinking: what’s a spark plug? You don’t need to know now. I have mentioned starting the car, which was not always easy and one problem was the battery. It was a big heavy thing, handled with care because it contained acid and not the most reliable part of the car. Power from the car creates electricity which is stored in the battery and was used to power lights and the starter motor. If electrical connections were not good, the battery gradually drained and the immediate symptom was a failure to start. I can remember taking the thing out, carefully, and charging it up overnight from the mains supply. And of course there were jump-leads which enabled you connect two cars together. Your battery could jump start another car. The pictures above are fairly typical of cars in the fifties. They show the typical shape, less aerodynamic than modern cars. They were generally black but were available in grey and some blue and green colours that looked fairly greyish. 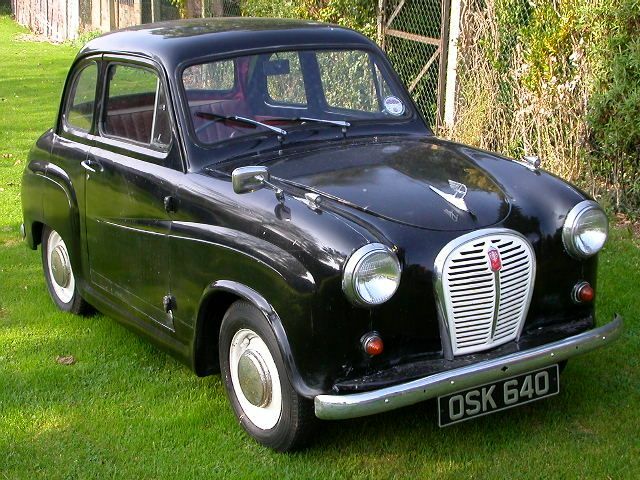 They were mass produced in England and foreign cars were rarely seen. So you only had a few different models to choose between. 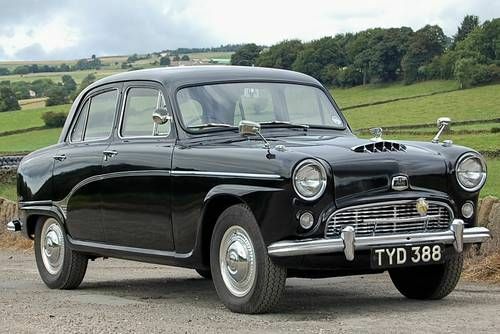 Note the wing mirrors, quarter lights, flat hub-caps, (not the decorative modern ones,) and the chrome bumpers and fittings. 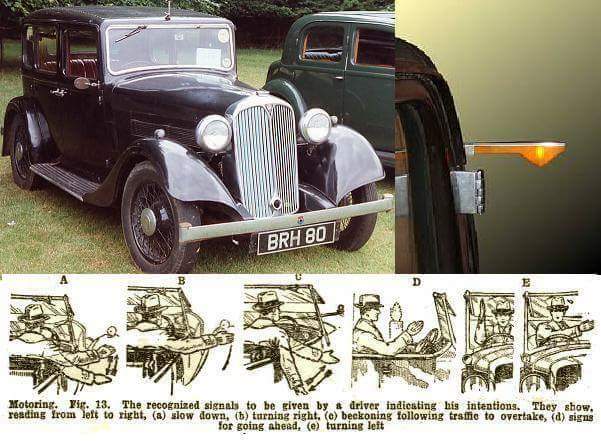 External running boards had only just disappeared and the top picture has an external door handle! Cars had two or four doors and a boot, [US: trunk,] a small compartment for luggage. There were no hatchbacks with the large rear doors and folding rear seats. 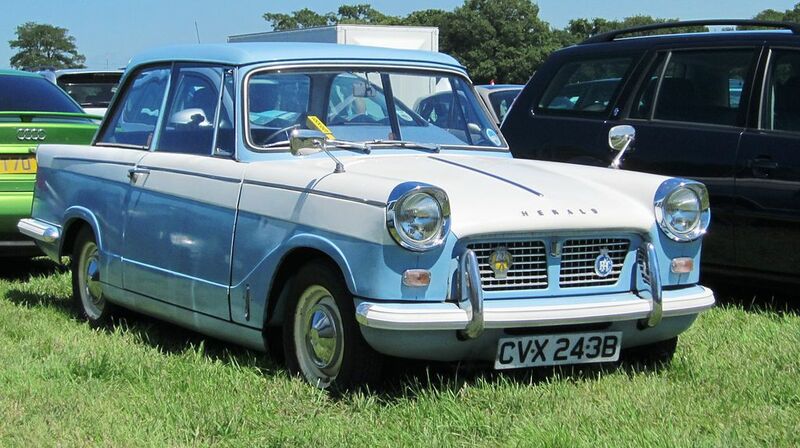 Here are the two models that emerged in the early sixties, the Ford Anglia and Triumph Herald. Both were revolutionary in their more square shapes and both were very popular. Then we had the Mini. Categories: Transport | Tags: accumulator, amber, battery, cars, choke, cigarettes, dipstick, Easter Avenue, Ford Anglia, garages, Ilford, indicators, jumper leads, MOT, MOT Test, oil, pedestrians, petrol, quarterlights, roads, rust, spark plug, starter, traffic lights, transport, Triumph Herald, underseal, ventilation, wing mirrors | Permalink. This time we have a few pictures that I have found recently in my wanderings round the Internet. I can’t guarantee where these photographs came from or their precise dates, but they are approximately from the fifties or sixties and remind me of my early days. Some will show more details of you click on the picture; some are quite low resolution. In fairly random order, I will start with shoe shops. This is what they looked like, with every size of every style in a box somewhere. New shoes always came in shoe-boxes. Service was personal with assistants measuring carefully for fit, especially for growing children. 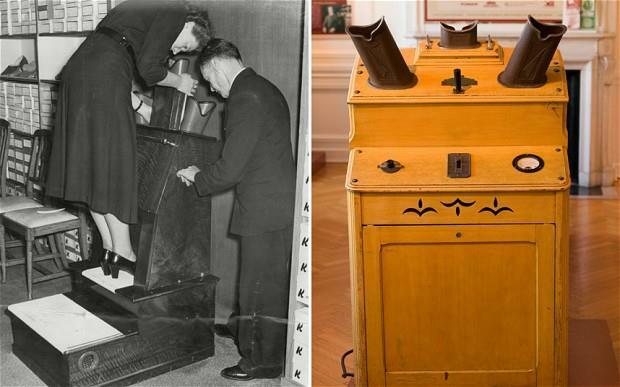 The next picture, believe or not, shows X-ray machines. 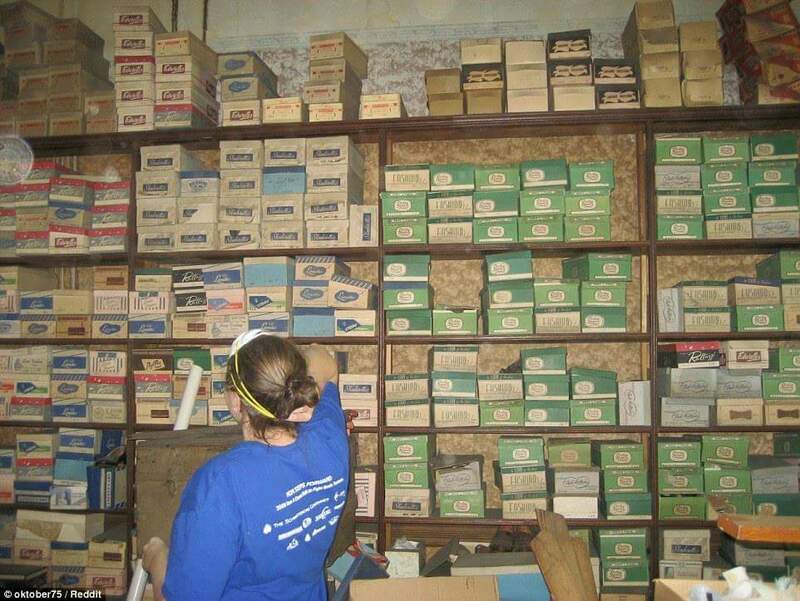 These were often available in shoe shops, used particularly for children to make sure there was enough room for growth. You can see how the child could look in at the middle, with both parents viewing at the sides. You could see the bones in your feet just as for X-rays used today in hospitals. Now, of course, Health and Safety considerations would not allow such a machine. The next picture is a garage – not a service station or a petrol station. You bought petrol for your car at the same place where you took your car for repairs and servicing. It was not self-service and the man who served you could also check your oil levels; repair or replace punctured tyres; adjust or clean spark plugs etc. You needed garage services much more then as cars were less reliable. This is a low quality picture so I can’t see the price. It might have been about 5p per litre! 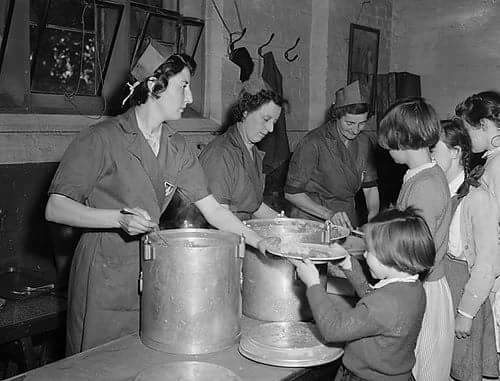 Now for memories best forgotten – school dinners. It was not the high point of the day. The food was plain and simple, dished out together. We queued for it and there was no choice. I have seen it said that the choice was: take it or leave it, but this was not true. You had to take it and you were expected to eat it. 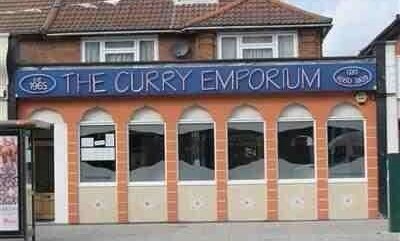 Another, much nicer, memory of food, The Curry Emporium. This Indian Restaurant opened at Gants Hill in the early sixties, our first introduction to any form of non-English cuisine. I remember occasionally going with a group from Ilford County High School for lunch when we were in the Sixth Form, just after it opened. You could get a Prawn Pilau for 6s 8d. (That’s 33p) The Curry Emporium gave me my first experiences of curries, pilaus, biryanis and chapattis. It was all excellent food. I still enjoy Indian cooking. (I didn’t have to say ‘at home’ because that was where people ate their meals.) The picture may be American because that looks like a coffee pot in the background on the oven. 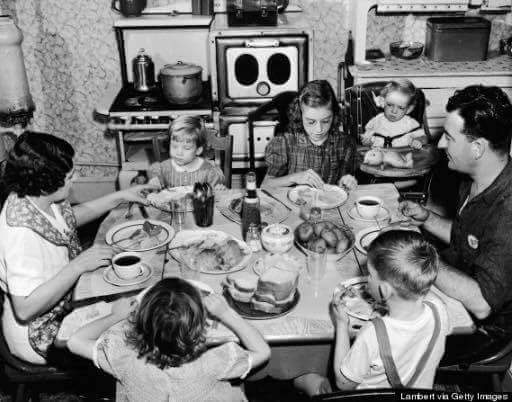 Very typical of the era is the fact that everyone ate together at the same time, sitting round a table. It was the easiest way to do it and they had no television to tempt them away. It was, of course all prepared by the mother of the family, the housewife. This looks like an entertainment centre. 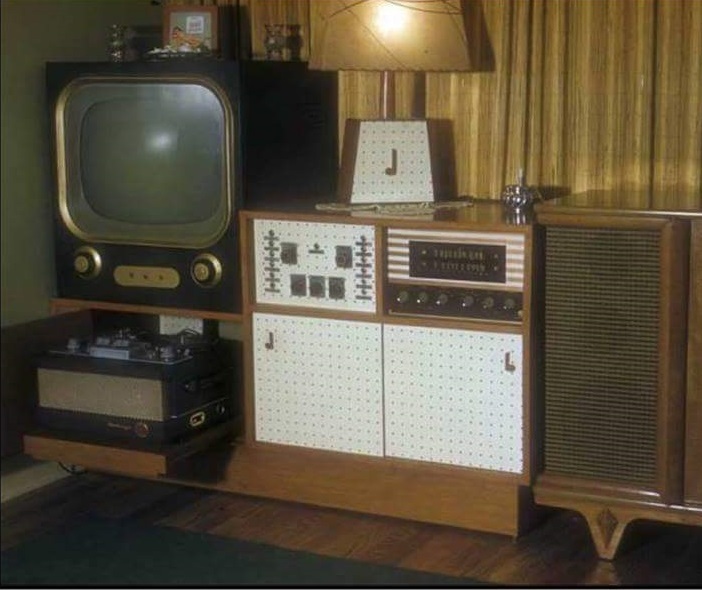 Underneath the television is a reel-to-reel tape recorder and by its side is a radio and record player. At the time this was very modern. All of this now could be part of your smart phone! The goods are tucked away under the counter, much of it in boxes. The assistants would get things out and help you choose. See  Are You Being Served? 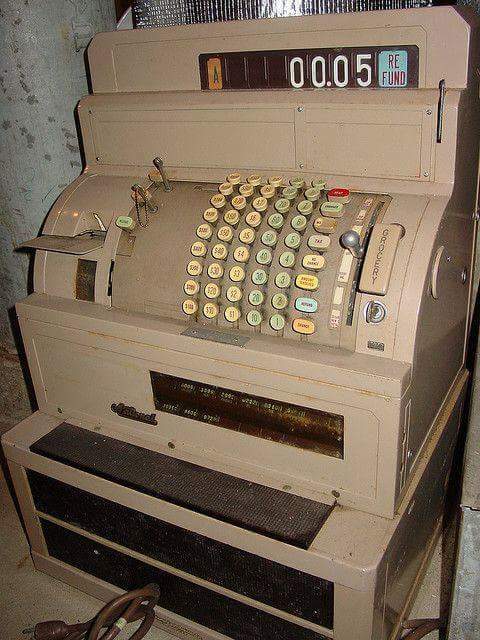 It looks post-decimal, but I think it may be American and older. See  How did we Manage Without … ? I think in the forties cocoa used to be the main bedtime drink, made with warm milk. We had Ovaltine and Horlicks, both of which had their appearances at our household. 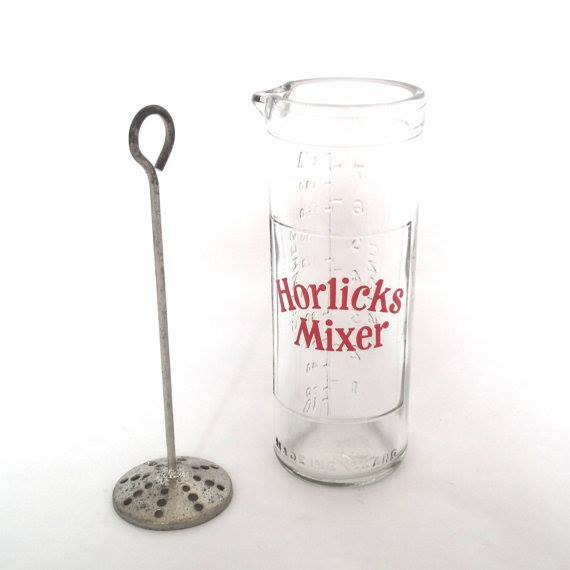 Shown here is a Horlicks mixer. Hot milk was poured into it, over a measured quantity of a dried powder mix. Using the plunger mixed them together into a smooth drink, also introducing bubbles of air to make it a frothy drink. 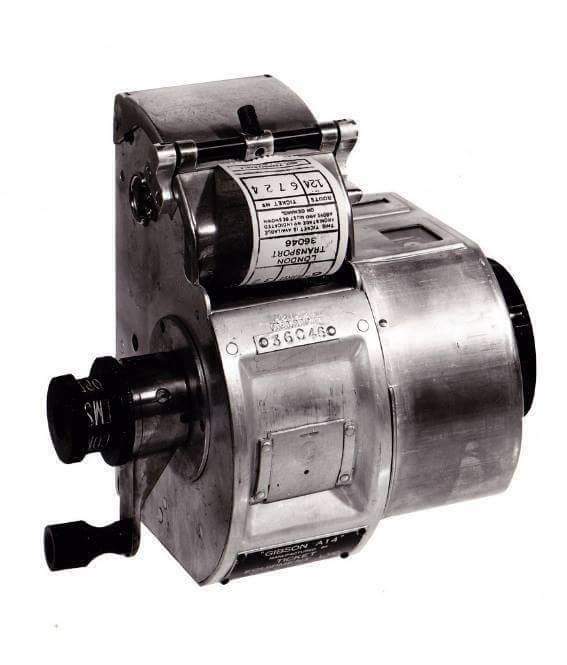 In the sixties a machine something like this produced bus tickets by printing the details on to a roll of paper, something like a modern supermarket receipt, but much more primitive. 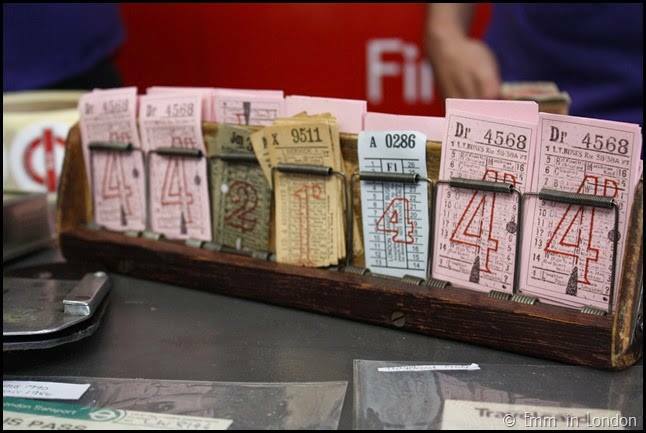 These are the real bus tickets that I remember fondly. Some of these pictures are American but there were many similarities between the two countries. I have had a comment on Facebook saying how much my blogs remind someone of growing up in Illinois. Categories: Mixed/General, Pictures | Tags: bedtime drinks, biryani, bus conductor, bus conductress, bus tickets, car repairs, car service, cars, cash registers, chapatti, clippie, cocoa, curry, Curry Emporium, department stores, driving, Dymo, Fifties, Gant's Hill, garage, Highway Code, Horlicks, ICHS, Ilford County High School, indicators, labeller, Ovaltine, petrol, petrol station, pilau, radio, reel-to-reel, school dinners, service station, shoe shops, shoes, Sixties, tape recorder, Telephone Exchange, television, warm milk, X-ray | Permalink.